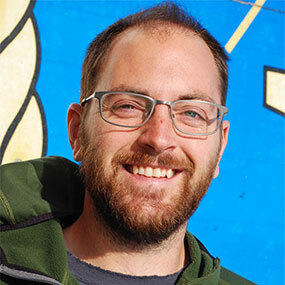 Matt Dornback brings a background of marine science, data management, and outreach to the NOAA National Centers for Environmental Information. 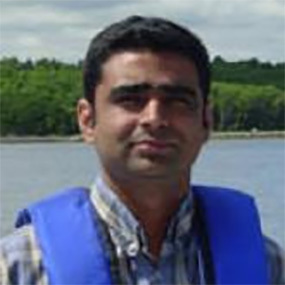 Currently he works with the Deep-Sea Coral Research and Technology Program to manage their data and make it available to the public through deepseacoraldata.noaa.gov. He holds a B.S. in Marine Biology from the University of North Carolina Wilmington and a M.S. 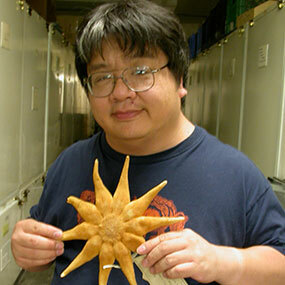 in Biological Oceanography from the University of Southern Mississippi Department of Marine Science. 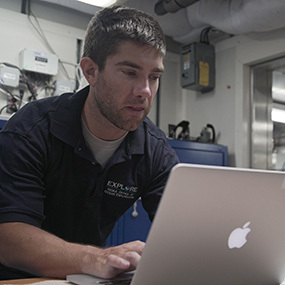 During cruises, Matt manages the data collected from samples collected by the ROV and works with the Science Leads to properly handle and preserve the specimens for further scientific analysis. 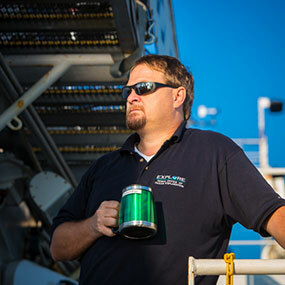 Kelley Elliott is the Senior Expedition Manager for the NOAA Office of Ocean Exploration and Research’s telepresence-enabled exploration program. She holds a Master’s degree in Maritime Archaeology from the University of Southampton and a Bachelor’s degree in Environmental Conservation from New Century College, George Mason University. 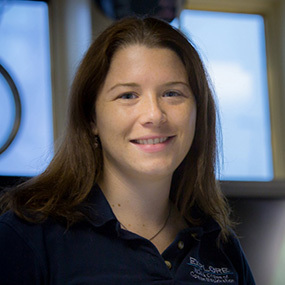 Kelley has been planning, coordinating, and managing expeditions conducted by NOAA Ship Okeanos Explorer since joining the operation in 2009. 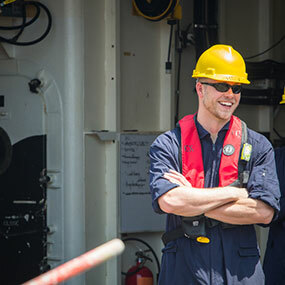 In this role, she acts as a liaison for science and operational partners onshore as well as coordinating the mission planning process between all personnel onboard the ship. Nikola Rodriguez is a NOAA Educational Partnership Program intern; she will be working on video annotation post-dive analysis with Mashkoor Malik. 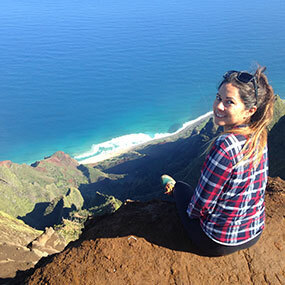 She is an undergraduate at the University of Hawaiʻi at Hilo, where she is pursuing a B.S. in Marine Science with a minor in Chemistry, a Marine Option Program (MOP) Certificate, and a Hawaiian Culture Certificate. As a turtle responder with the Marine Fisheries department on the Hawaiian Green Sea Turtle response team, Nikola helps stranded, sick, and injured sea turtles. She also assists with educating the community on the importance of protecting the Hawaiian Green Sea Turtle. 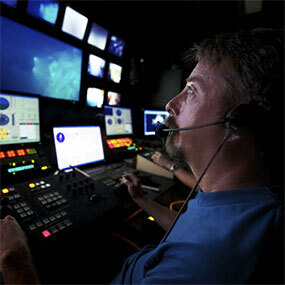 Her main interests are in coral reef health and underwater ecological surveying. 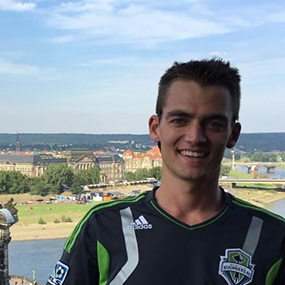 Nikola is an AAUS scientific diver for the University of Hawaiʻi and recently completed the two-week Quantitative Underwater Ecological Surveying Techniques (QUEST) field course at Kealakekua Bay on the island of Hawaiʻi. 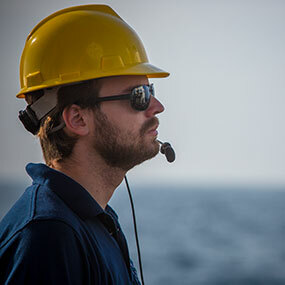 QUEST provides science divers with extensive training in survey techniques used by agencies worldwide. 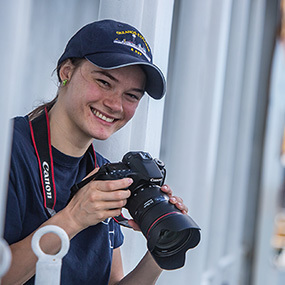 Her future plans are to live in Hawaiʻi and work for NOAA as a science diver conducting benthic health research at the Papahānaumokuākea Marine National Monument. 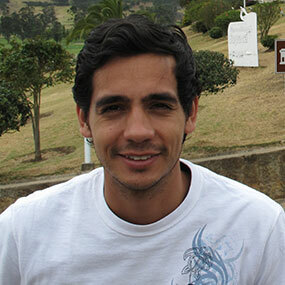 Outside of school, Nikola enjoys freediving, surfing, and hiking into the hard-to-reach places around Hawaiʻi. 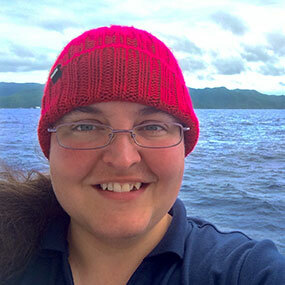 Tara Smithee has been sailing on Okeanos Explorer expeditions since 2012 as a producer, editor, and ROV camera operator. 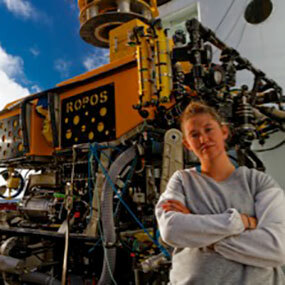 She holds a Masters in Ocean Systems from Stanford University and is pursuing a second Masters in Science and Natural History Filmmaking from Montana State University. 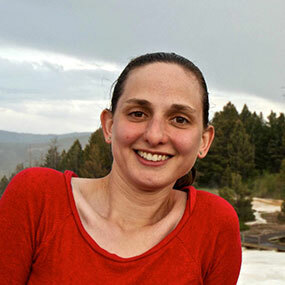 Tara has a tremendous interest in science and exploration and amazement for the natural world. She is an avid scuba diver and one of her most treasured marine memories was swimming with dolphins in the wild. When not at sea, she enjoys dancing and writing in Portland, Oregon. 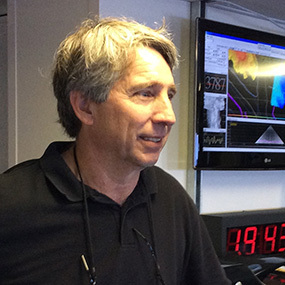 Dave Wright joined the Ocean Exploration Program in 2009 to help bring to life the ROV component aboard the Okeanos Explorer. 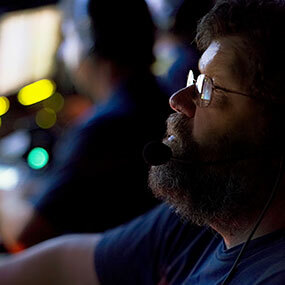 He is a self-taught engineer who brought a set of skills that most would envy. 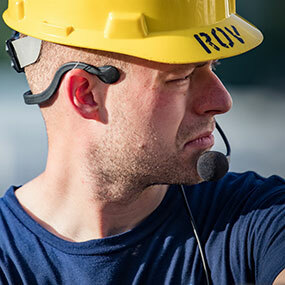 Highly respected in the field of underwater technology, Dave spent a decade working with Dr. Robert Ballard at the Institute for Exploration. 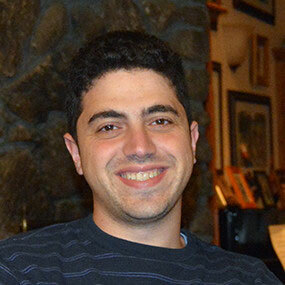 Prior to that he was a development engineer at the Monterey Bay Aquarium Research Institute. Dave is one of our senior pilots and, in addition to being an invaluable electrical engineer, he is one of our most respected mentors to the younger generation we seek to train. 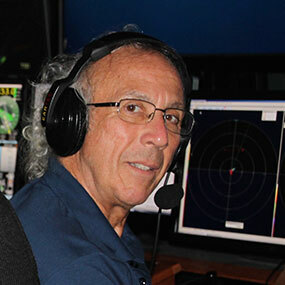 Dave is a veteran of some of the earlier ocean exploration projects, having served as pilot on the 2004 Titanic cruise, the 2004 and 2005 Mountains in the Sea cruises, and the 2005 cruise to Lost City. 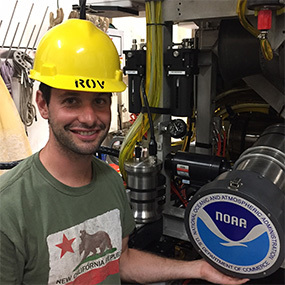 He is a co-inventor of the ‘Aquatic Autosampler,’ a fully automated system for in situ species identification of toxic phytoplankton, developed at the Monterey Bay Aquarium Research Institute. When not on assignment with Ocean Exploration, Dave enjoys exploring the brownwaters of the Ohio River near Louisville in ‘Kitty Hawk’, a 1941 mahogany-on-oak motor cruiser.